OK ! this is the bread I am going to make in my diner when I quit my job and do something crazy! 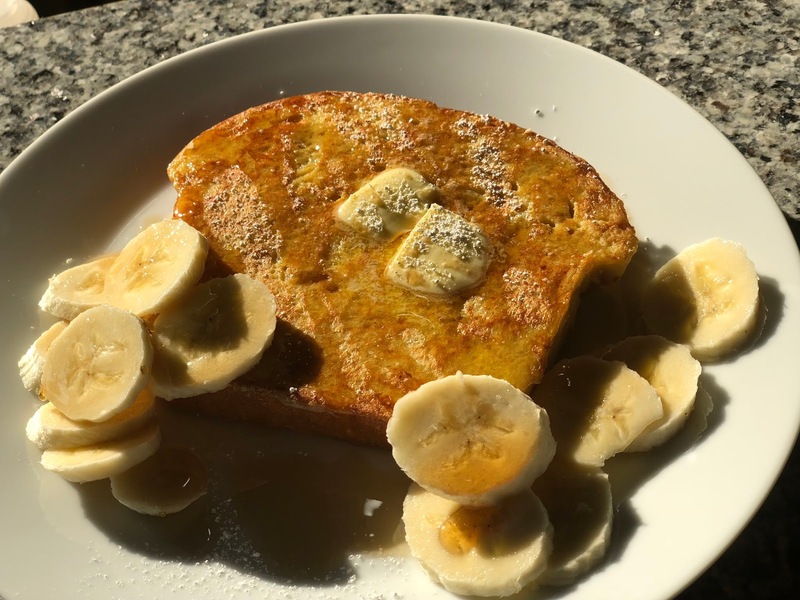 Makes the BEST French Toast! This is the French Toast Guy Fieri is going to tell me is money! I am sure it will have a blob of whipped cream on it and some crushed praline nuts on it as well but that’s just glamming up for the cameras! 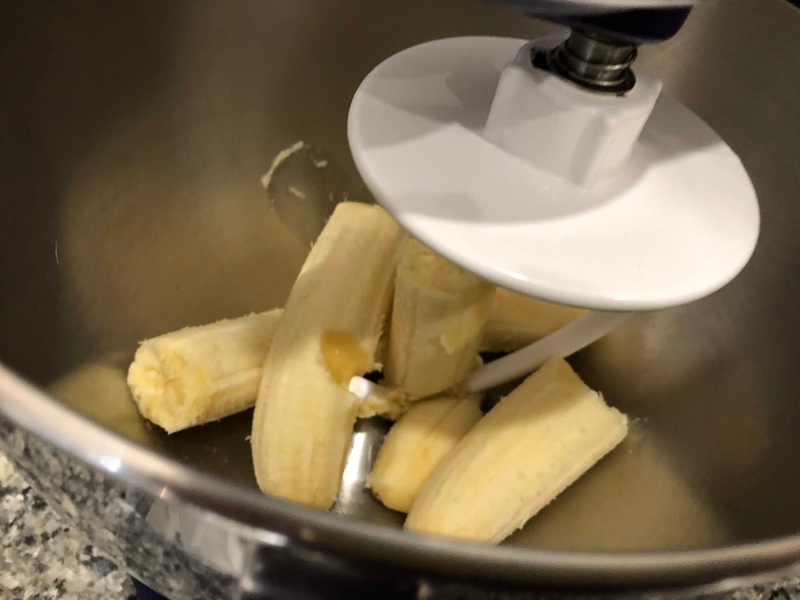 Step 1: using the bread or paddle attachment- squish bananas in a stand mixer – of course you could do this recipe by hand if you want a workout. 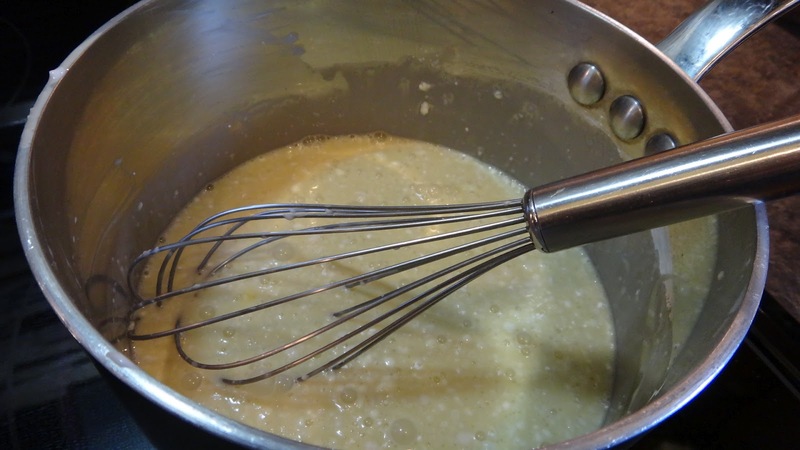 Step 2: add eggs to a liquid measuring cup, whisk with fork. 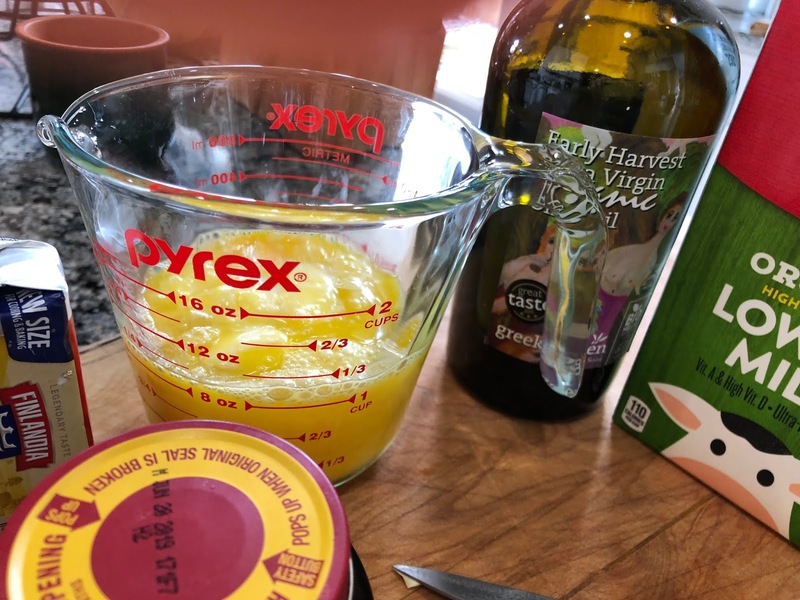 Add orange zest, 2 tbsp of melted butter, olive oil and then fill with milk of your choice until you reach 1 cup on the measure. Step 3: add the liquid to the bananas and change to the paddle attachment. Step 4: add the yeast and leave for 10 minutes. Step 5: add flour and salt and mix on slow to incorporate and then on high for at least 3-4 minutes with the dough hook. 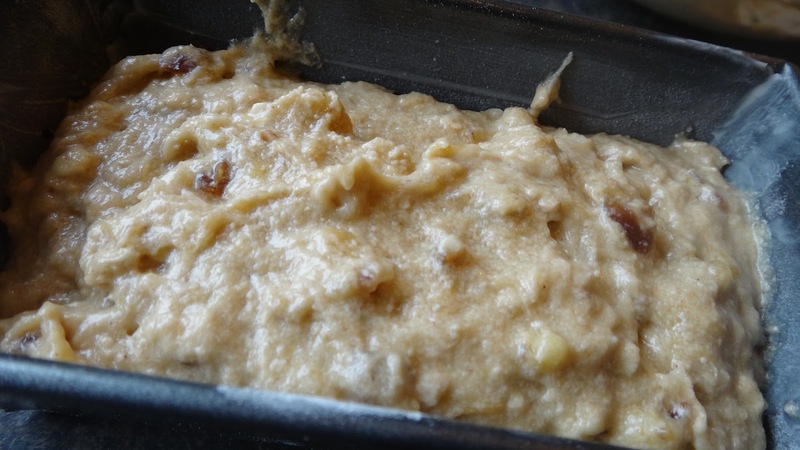 Turn out onto the counter and hand knead for a few seconds to make sure that the dough is not sticky. This is where you feel the dough and add small sprinkles of additional flour until it no longer sticks to your hands. 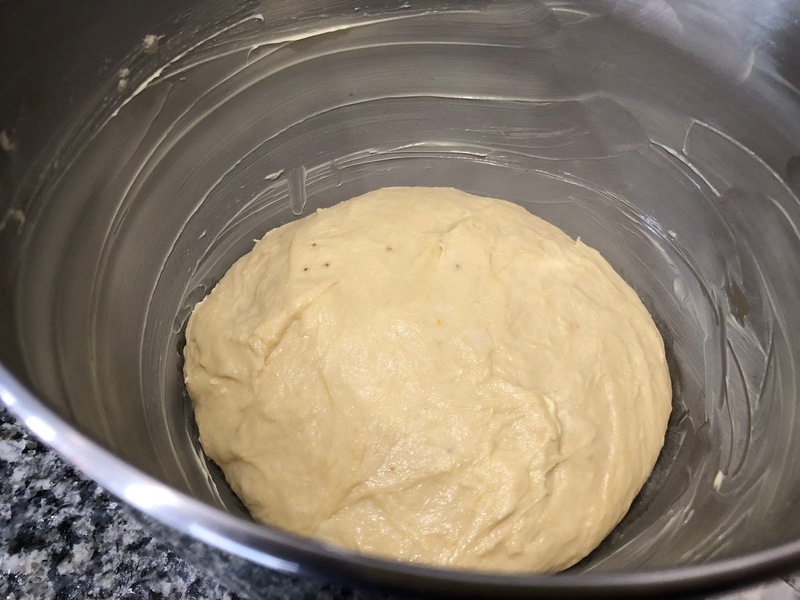 Step 5: wash the bowl and butter sides, then coat the soft dough with enough butter so so that the plastic wrap that you will cover the bowl with doesn’t stick to the dough if it rises to the top. Leave in a warm place for 2 -2/12 hours. this is a rich bread and you are looking for it to be doubled in size how ever long that takes. Step 6: turn out the dough from the first proof and gently deflate and roll up to fit into a buttered bread pan. Cover with a buttered or oiled piece of plastic wrap -I just use the one I had on it for the first rise. Leave until doubled again this is only about 1 hour. Step 7: bake at 350 degrees F 30-45 minutes. If bread appears to be browning too quickly tent with aluminium foil for the last 10-15 minutes. brushed with a bit of butter ! 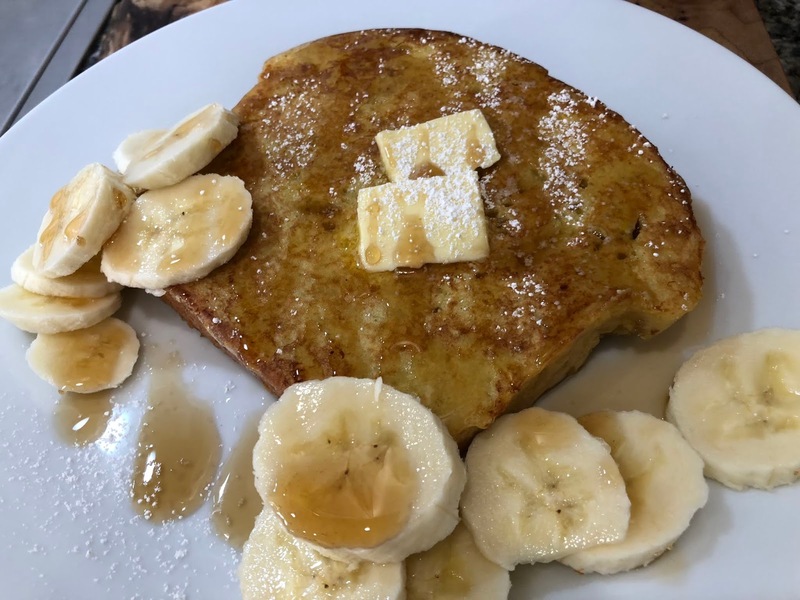 Great the next day as French Toast (just mix eggs with milk or cream a bit of sugar or honey, soak bread for a minute they fry in some more butter and top with maple syrup,sliced bananas and powdered sugar!! Get the coffee you are gonna love this! 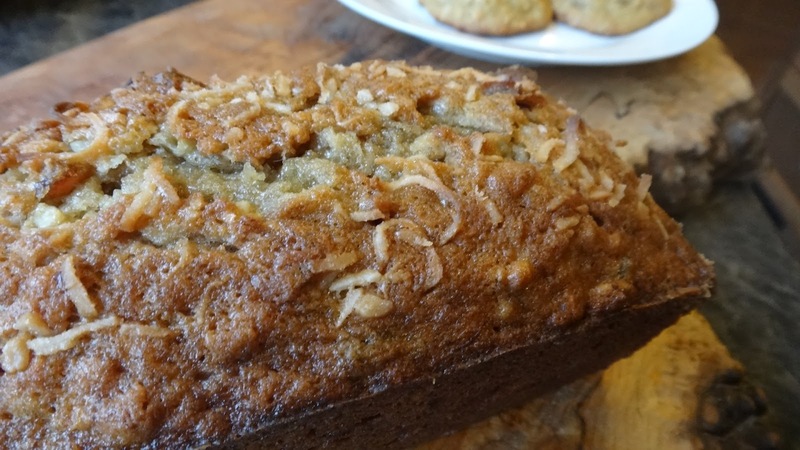 Instead of just making banana bread why not make banana, pineapple and coconut bread. 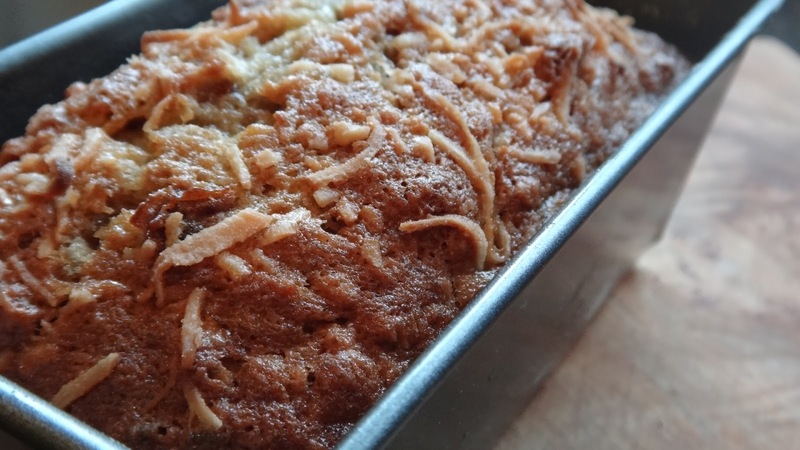 This is a quick bread you can make with canned pineapple, some shredded coconut and some rotten looking over-ripe bananas. 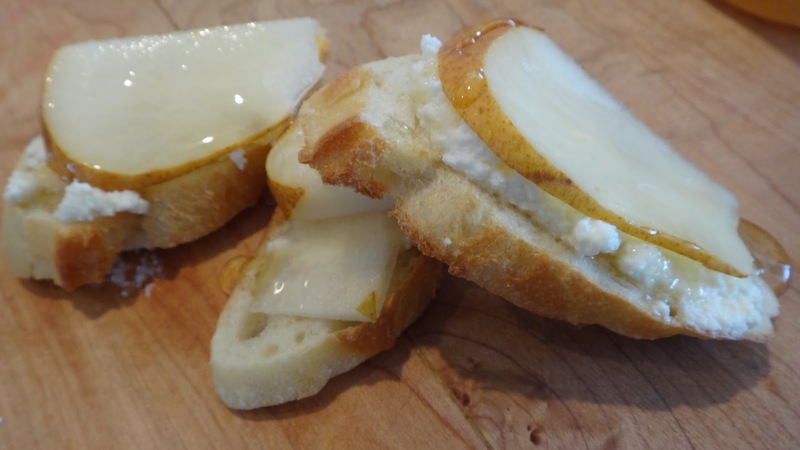 It is moist and delicious because of the fruit and extra virgin olive oil. You can feel good about giving your family a treat that has many good ingredients contained in it. 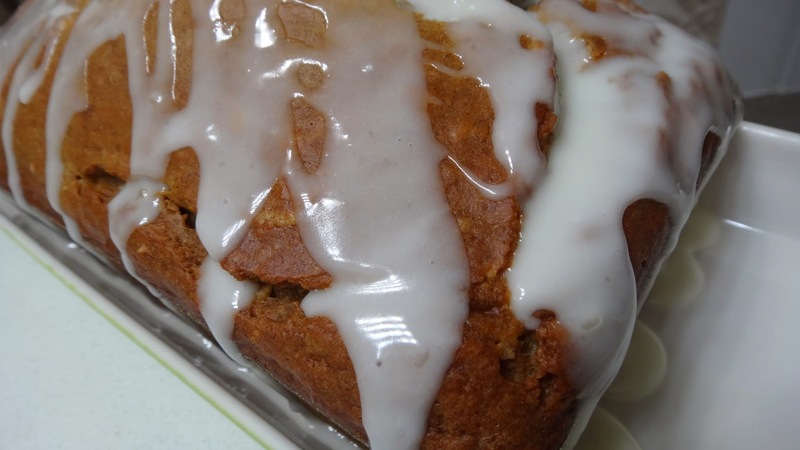 It can be topped with cream cheese icing, a simple glaze like I have made or nothing at all! Step 1: this is an easy recipe. 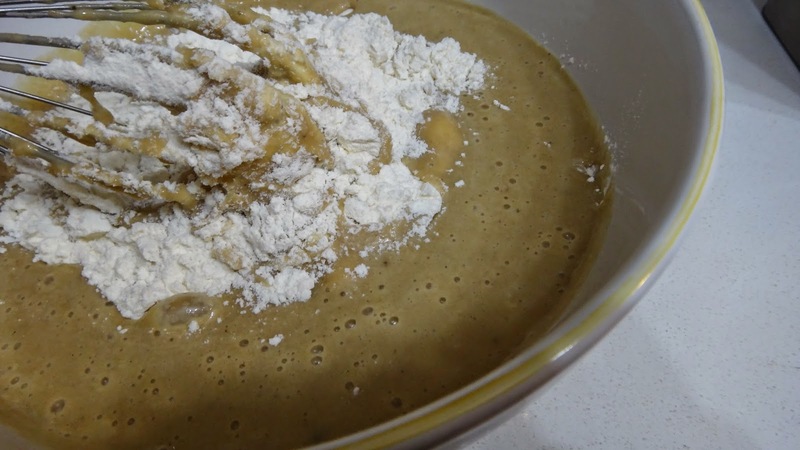 The wet ingredients are mixed in a blender and then poured into the dry. Start with the bananas added to the blender to puree. Step 3: butter and flour a loaf pan. 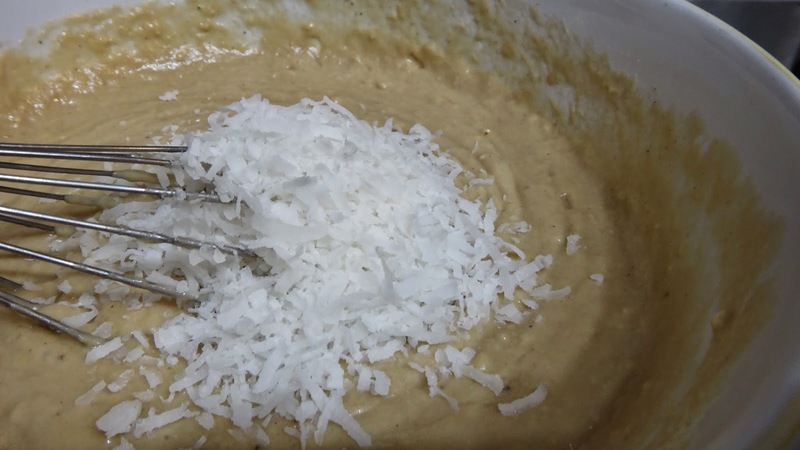 Step 4: in a large bowl add all dry ingredients (except coconut) and combine with a whisk. Step 5: pour in the wet ingredients and gently stir with the whisk until just incorporated. 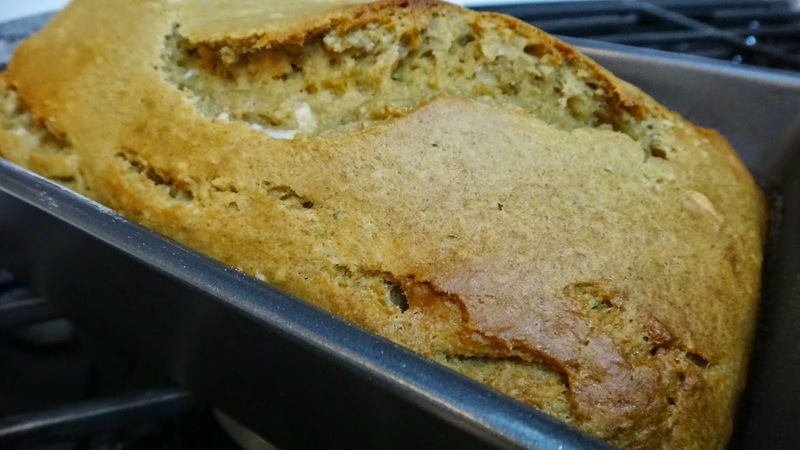 Don’t beat the batter or stir too hard or too long or you will have a tough, dense cake. 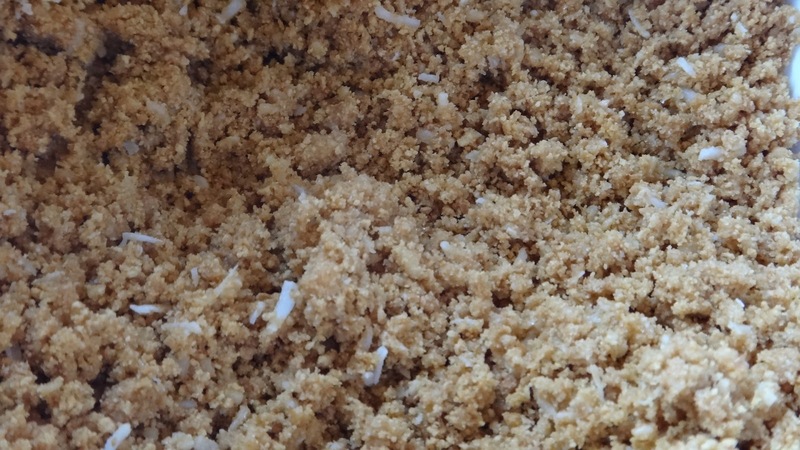 Step 6: gently mix/stir in the coconut until just incorporated. Step 7: pour into prepared pan and bake at 350 degrees F for 45 minutes or until a toothpick inserted in the centre comes out clean. once baked allow to cool 15 minutes in the pan before removing to a cooling rack. 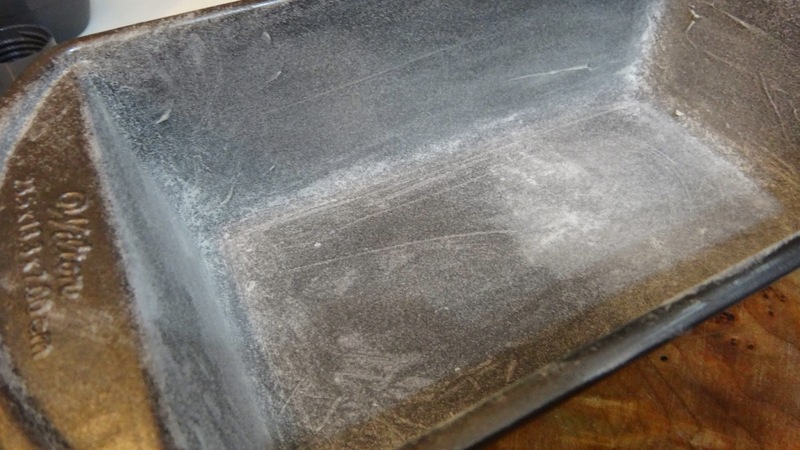 once completely cooled pour over the glaze you made by just adding icing sugar to the reserved pineapple juice until it is as thick as you like. 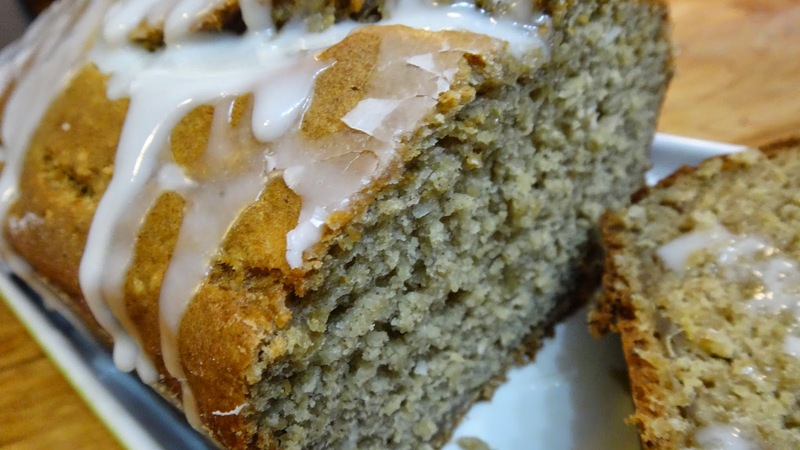 It is moist and dense and delicious. 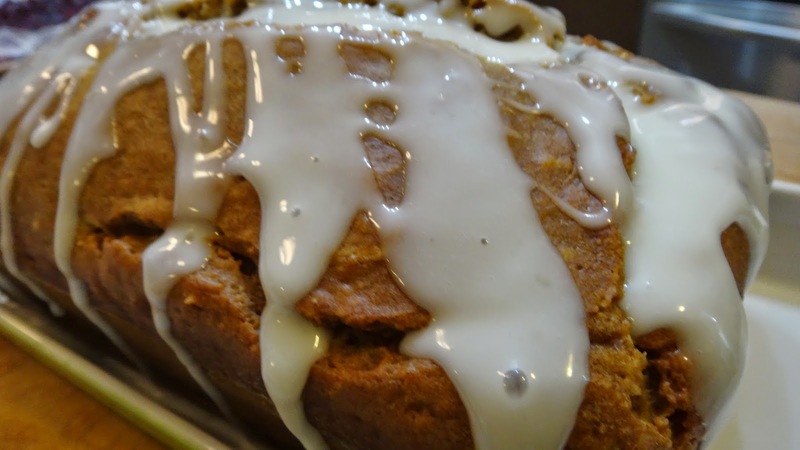 Banana Cinnamon Rolls – Makes 6 rolls! 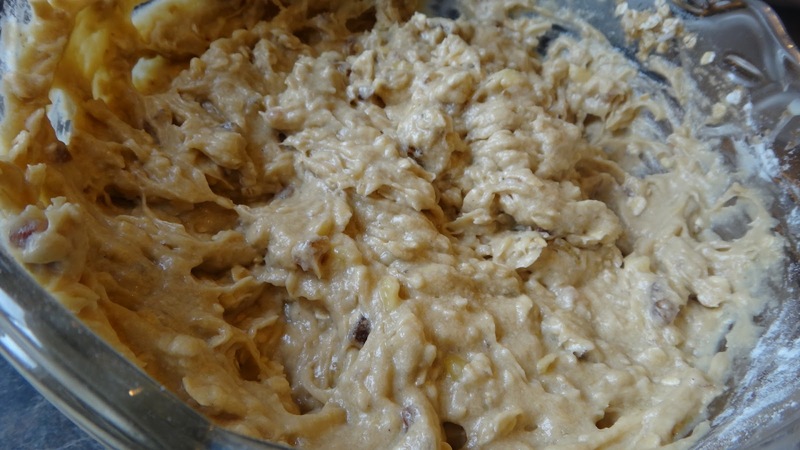 These are lovely soft yeast cinnamon buns with banana right in the dough. 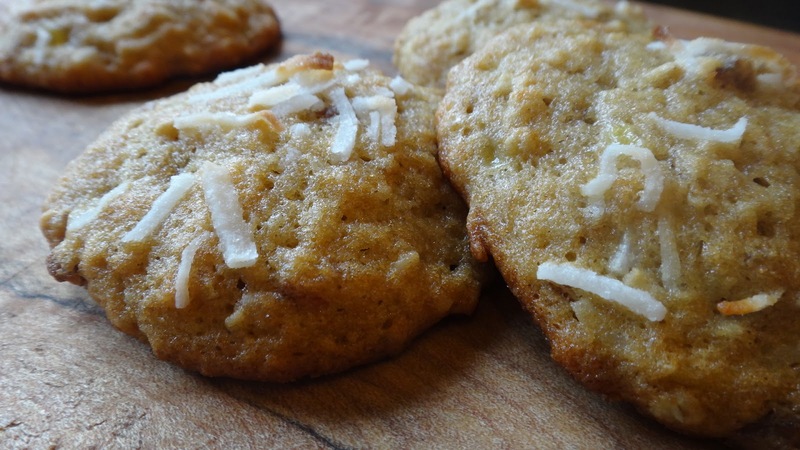 They are sticky and not too sweet with a slight banana flavour. 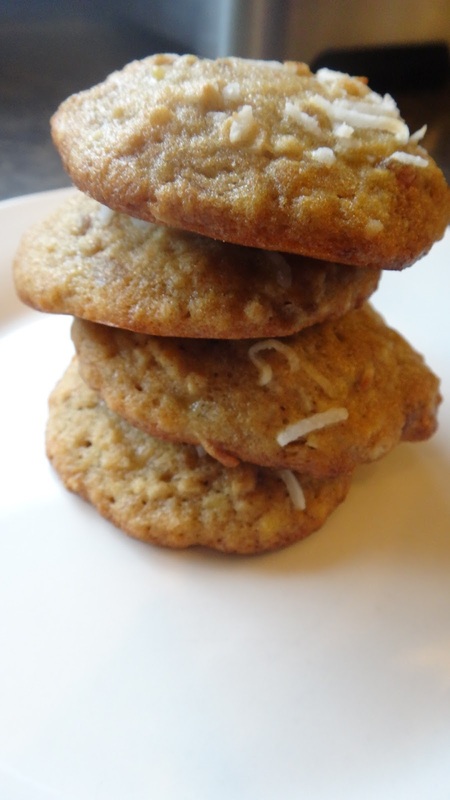 The best part is that they are a half batch which is perfect for a small group. So even if there are just two this is a nice recipe to make. Makes 6 rolls. 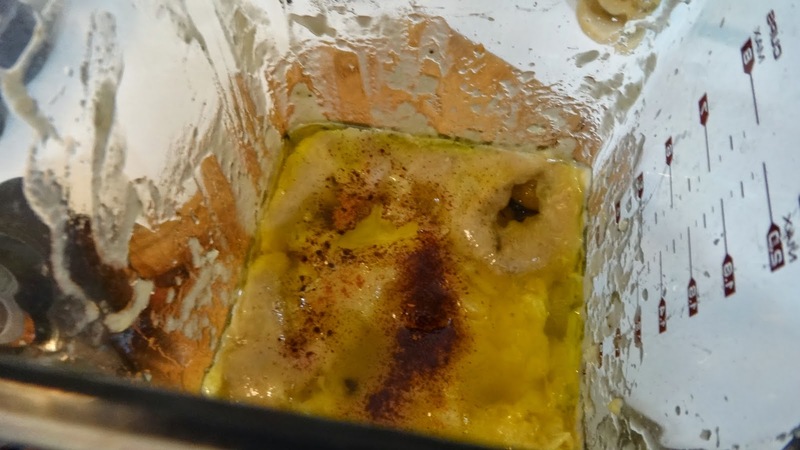 save 2 tbsp of filling and brush tops with a bit of melted butter and dip or sprinkle extra cinnamon sugar on tops. I always gather all my ingredients so that I don’t forget something. Step 1: in a small measuring cup heat milk and honey 25 seconds in microwave. Place into a stand mixer with the paddle attachment. 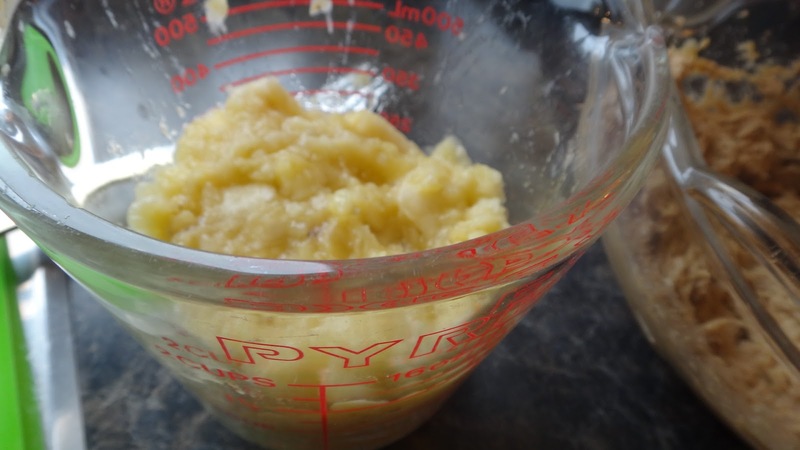 Add yeast and mix a few times. Let stand for 5 minutes to make sure yeast is activated. Step 2: add egg, sour cream, bananas and vanilla. Mix for a few seconds. 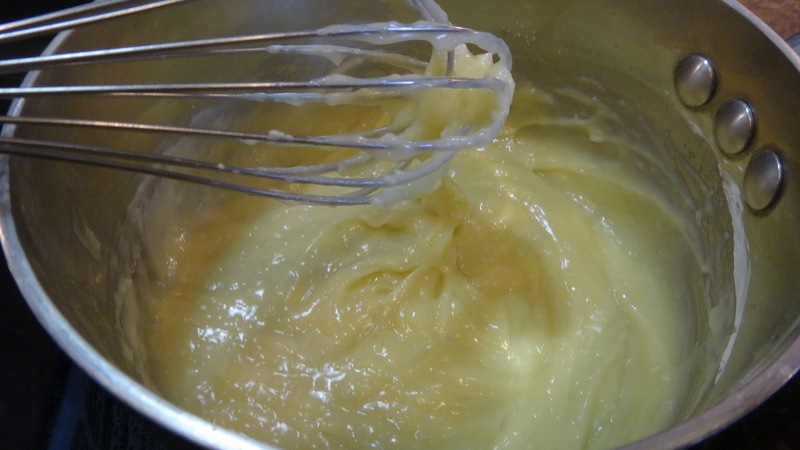 Add softened butter and mix again. Step 3: add 1 cup of flour and salt. Mix well. Step 4: add 2nd cup of flour (reserving last 1/4 cup for the counter) Mix well. Step 5: add the last 1/4 cup to the counter and turn out dough on to counter. Mix well. 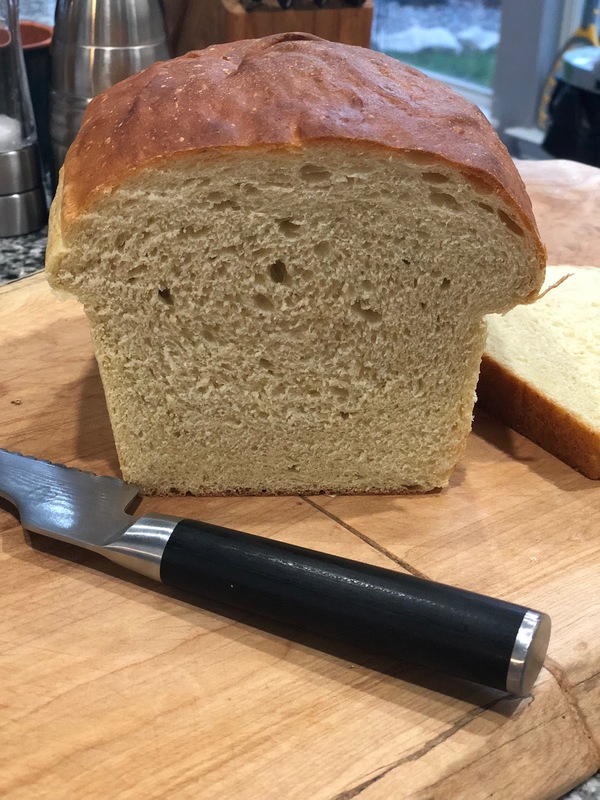 If you don’t need all the flour don’t use it all. 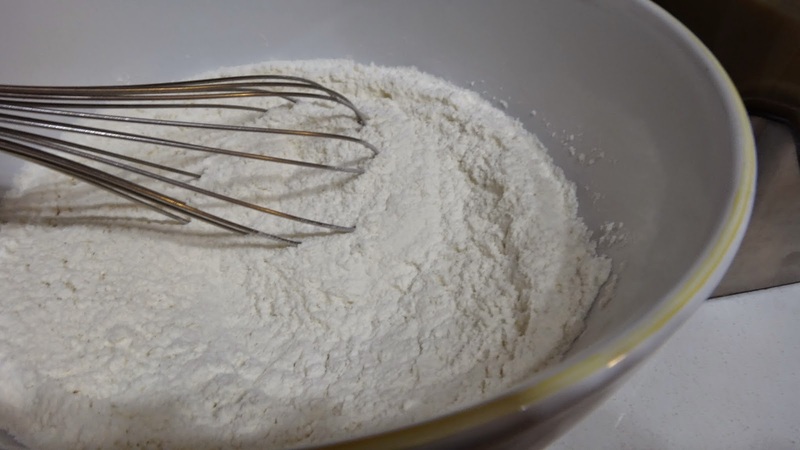 You want to add enough flour so the dough is no longer sticky to the touch. The dough is a lovely soft dough when done. 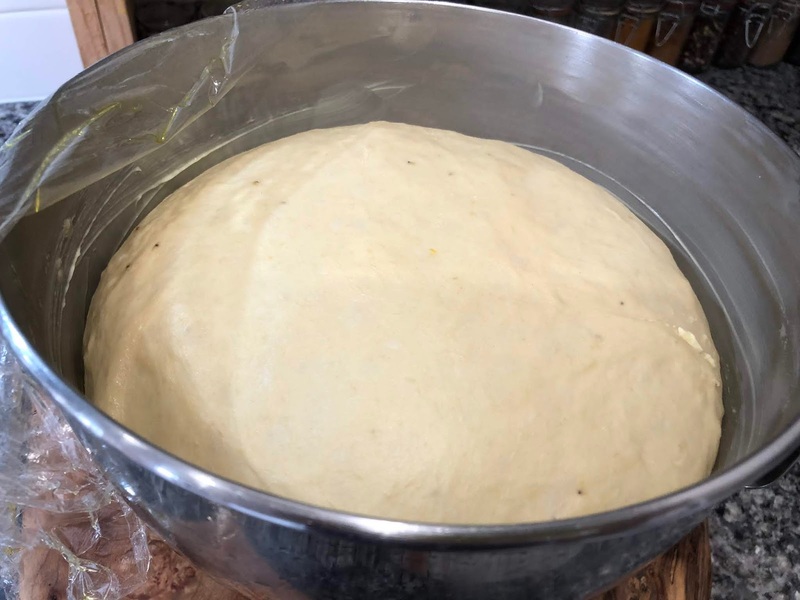 Step 6: add to a bowl and cover with plastic wrap and let rest for 2 – 2 1/2 hours or until the dough has doubled in size. Step 7: to prepare cinnamon filling place sugar and cinnamon in a bowl and mix. Leave the remaining 1/2 stick of butter in wrapper on counter until dough rises. Step 8: once dough has doubled in size. Place a bit of flour on counter and turn out dough. Step 9: gently roll out dough to a rectangle mine was 14 inches x 12 inches. 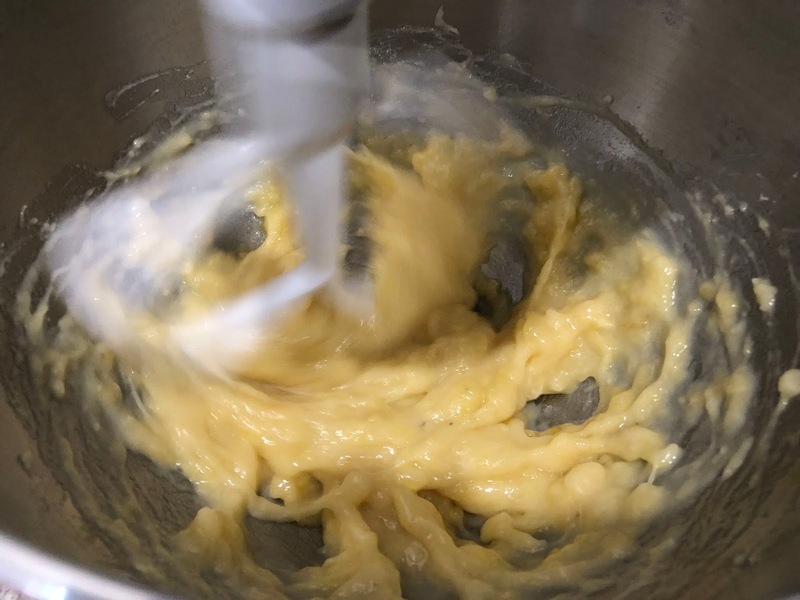 Smear the butter over the entire surface of the dough. Sprinkle all the sugar except 2 tbsp evenly. Step 10: roll up and slice in half. Then slice each half into 3. 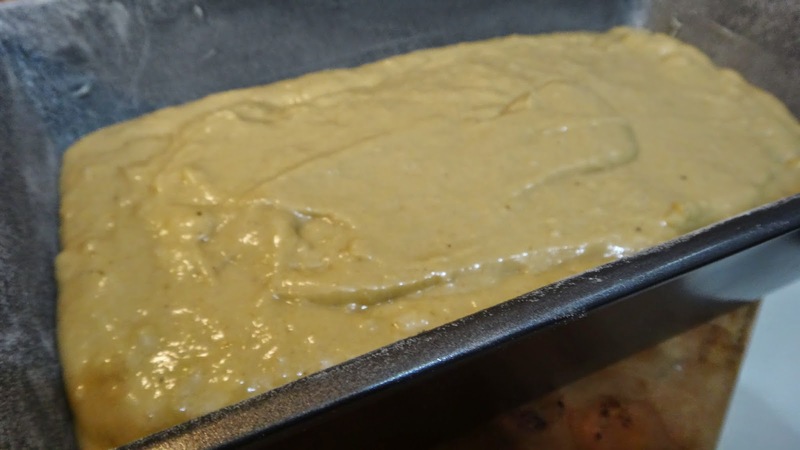 Carefully place each section into a buttered large muffin tin or silicone tray. Let rise in a warm place for 30 minutes to 1 hour until doubled. Bake in a 350 degree F oven for 20-22 minutes. Remove and let cool in pan. brush with a bit of melted butter and sprinkle remaining cinnamon sugar. finish with glaze! EAT while still warm. They are soft and fluffy and not too sweet. 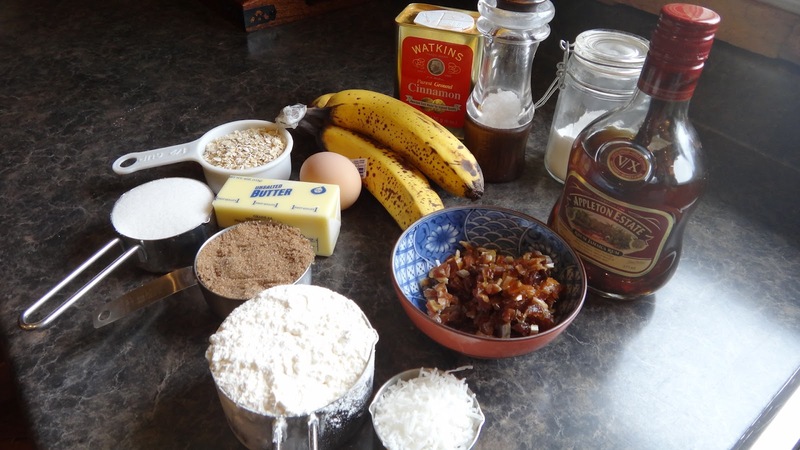 I wanted to make some brownies that were a bit different from the same old and so I decided to add some bananas and rum because they always go well with chocolate and these brownies were the result. A rich chocolate cake with chewy bites of banana and a slight undertone of rum. Step 1: in a 9 inch square pan butter sides and add a sheet of parchment paper for easy removal. Butter and flour all sides of the parchment well, tapping out excess flour. Set aside. 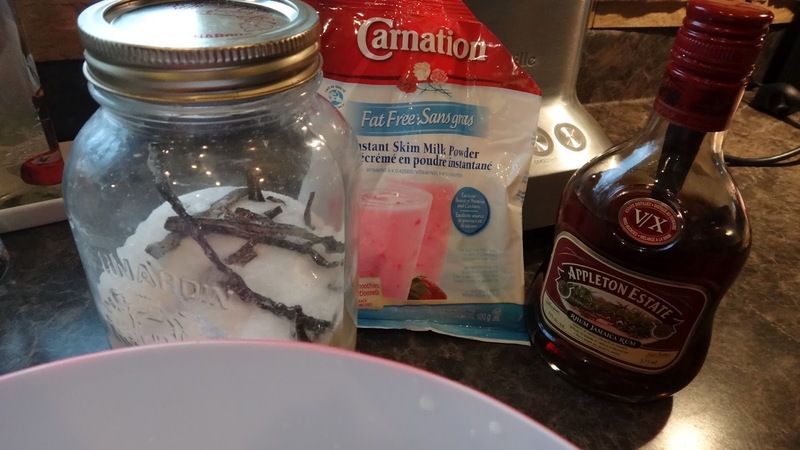 Step 2: chop a ripe banana and add to rum – I have made vanilla rum by splitting vanilla beans into my rum but, any rum will work fine. Step 3: in a small bowl add semi-sweet chocolate and butter pieces. Melt in microwave for 40 seconds, stir and melt another 20. Remove from microwave and stir until most of the chocolate has melted. Step 4: add chocolate, brown sugar and olive oil to a large bowl, Mix well. Add eggs and mix well again. Step 5: add flour, baking powder, cocoa powder, bananas and rum. Mix well. Step 6: pour into prepared pan and top with chocolate chips (or you could add some nuts if you prefer) Bake exactly 30 minutes to get a nice brownie with a bit of a gooey center. Let cool then you can lift out brownies with parchment paper and slice. 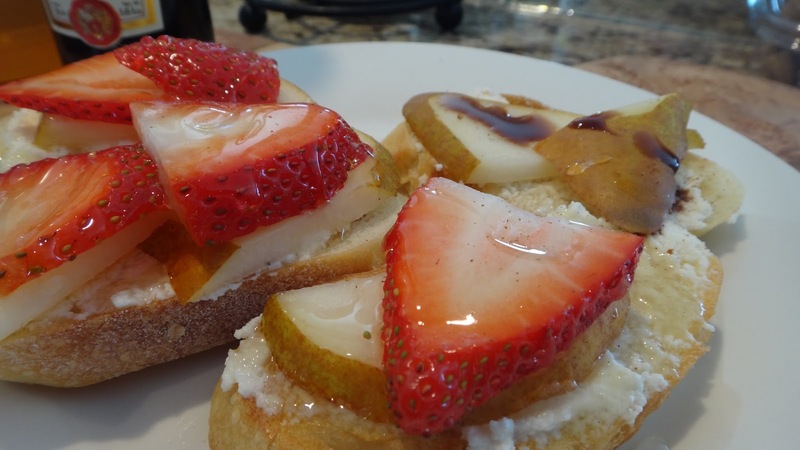 I love these for a breakfast or lunch. 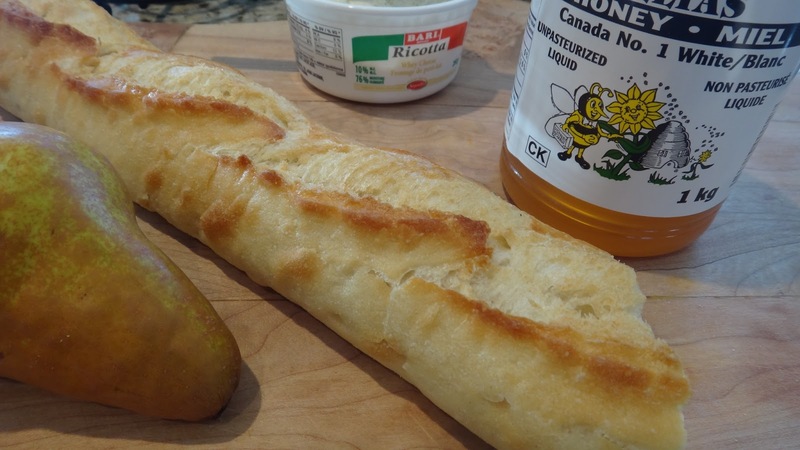 You can use a larger Italian bread sliced for larger pieces or simply as I have with a French baguette. 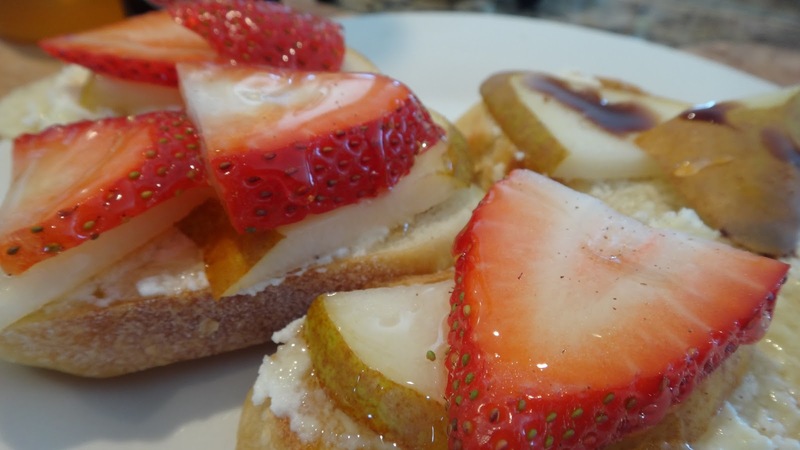 I lightly toast these in a toaster or pan and spread on some creamy ricotta cheese, place a few pieces of soft fruit and drizzle with honey. 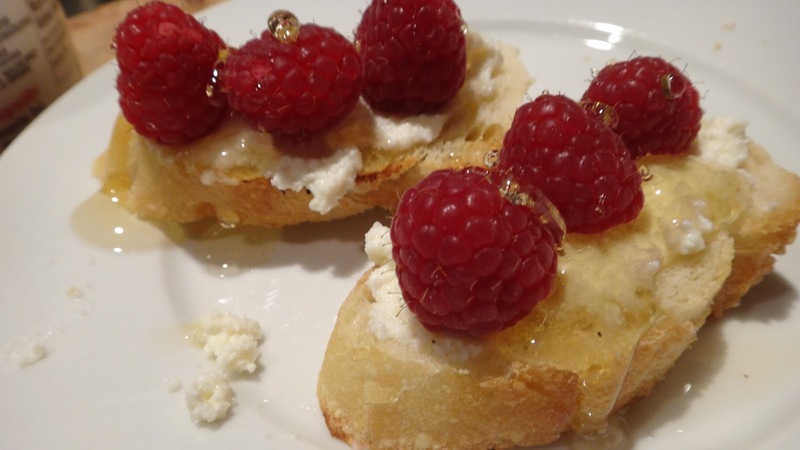 Simple and delish! Assemble: bread, cheese, fruit. 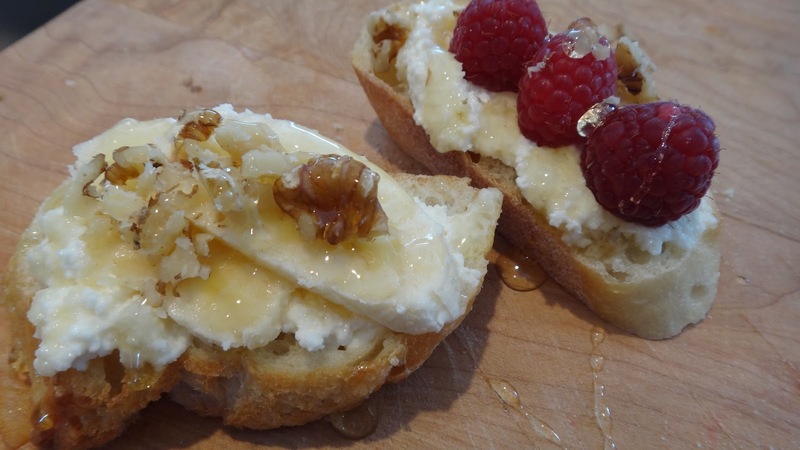 honey, nuts… a big mug of hot tea and EAT! 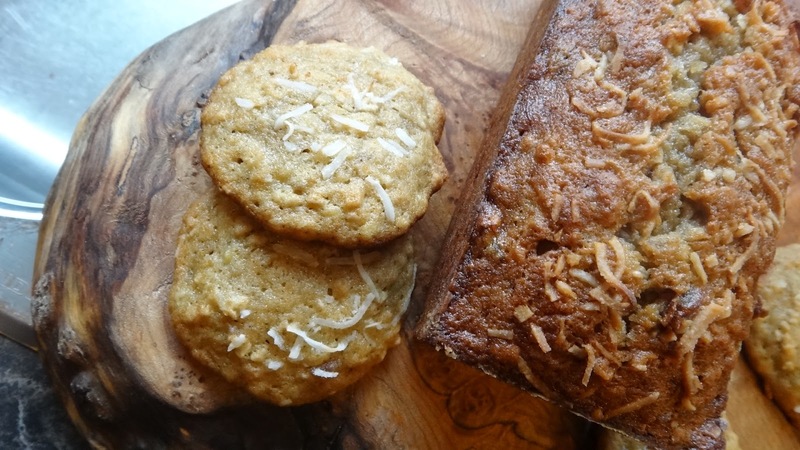 This is a recipe that can be made into a Coconut Banana Bread or you can chill the dough and use it to make Soft Coconut Banana Cookies. 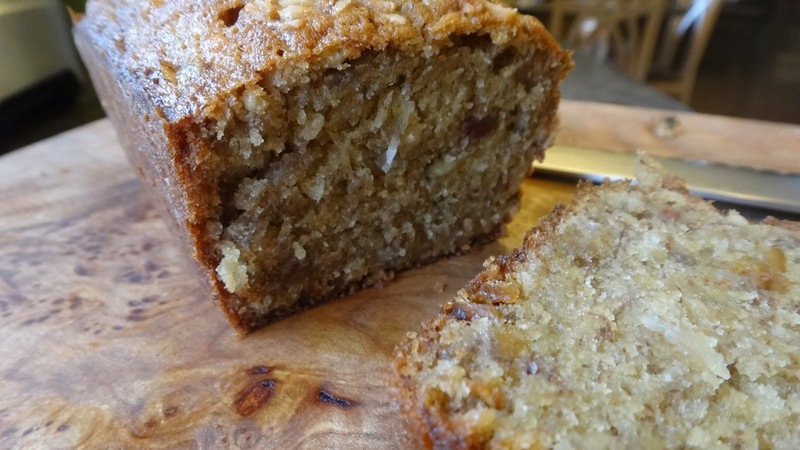 The next time you have a few over ripe bananas don’t throw them away, make a quick bread. It freezes well and lasts for days wrapped on your counter. 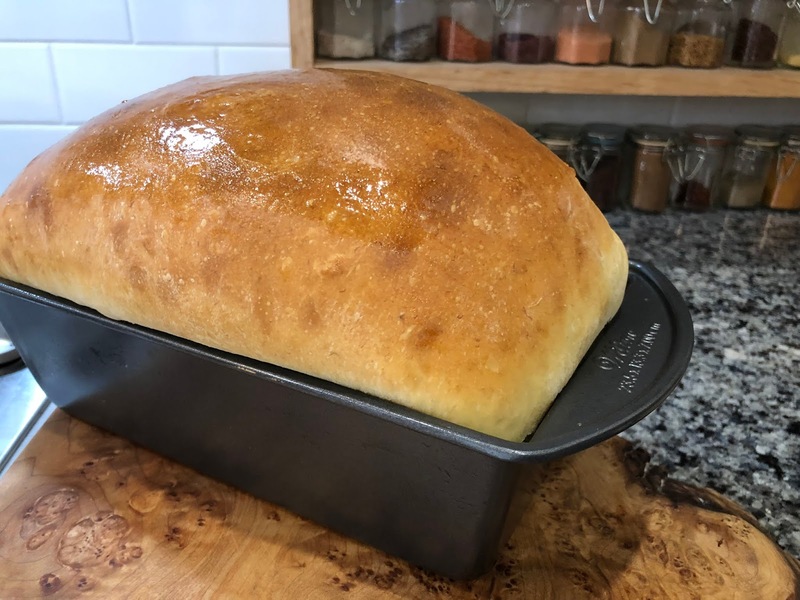 This makes 2 perfect little loaves (5 1/2 inch tins) or 1 regular loaf pan. Step 1: I like to gather all my ingredients and measure out everything before starting. This way I do not miss any ingredients. 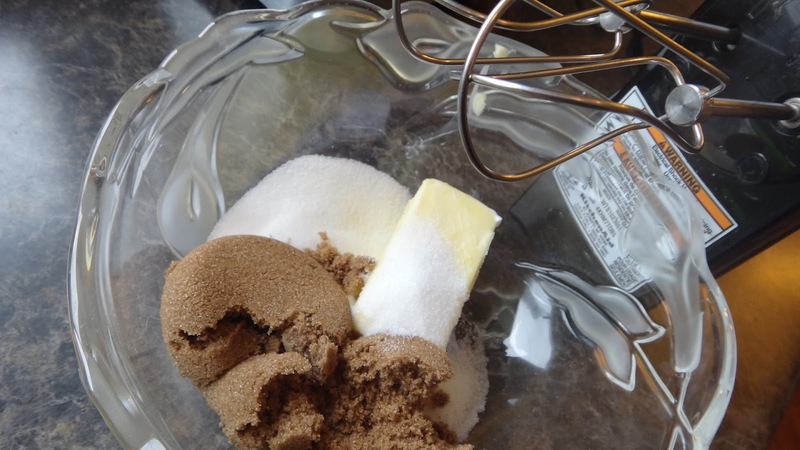 Step 2: start by mixing the butter and sugars with a hand mixer. 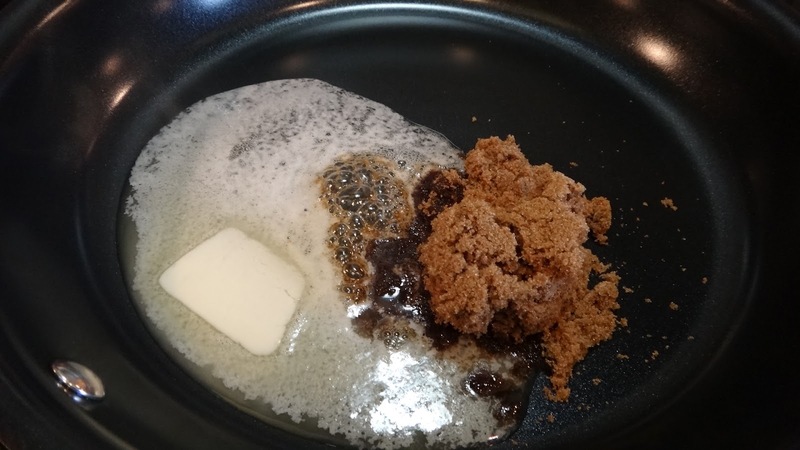 Make sure all lumps are broken up from the brown sugar. 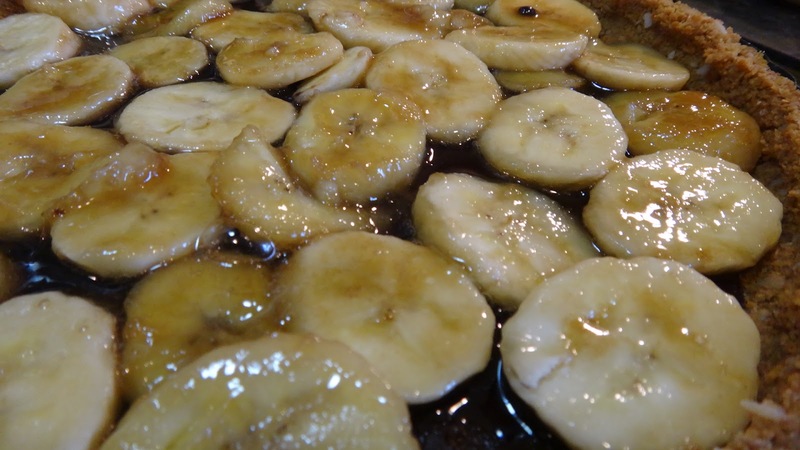 It will take 2-3 minutes.If you prefer, you can easily reduce the sugars to 1/4 cup each because there is lots of sweetness from the dates and the ripeness of your bananas. Step 3: add egg and vanilla or rum. I used my homemade vanilla extract made in rum. I think the bananas and the coconut and rum make it very tropical. Mix until smooth. 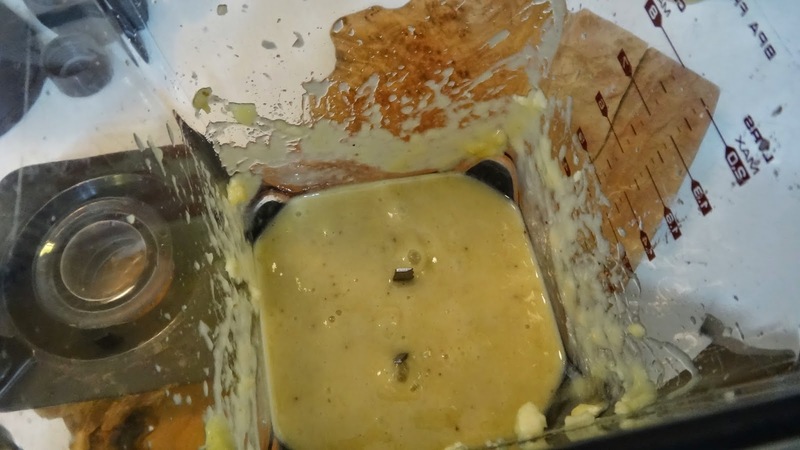 Step 4: mash bananas with a fork. 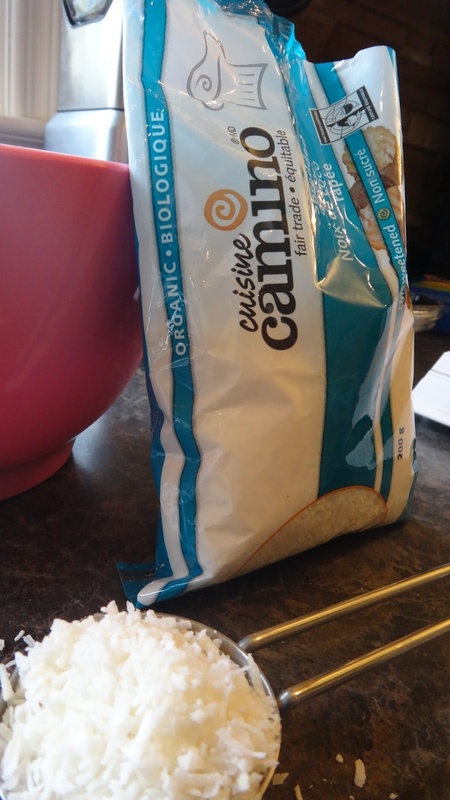 Step 6: in a small bowl add dry ingredients: oats, flour,baking soda, cinnamon and a pinch of salt. Briefly mix all dry ingredients into wet until just incorporated. 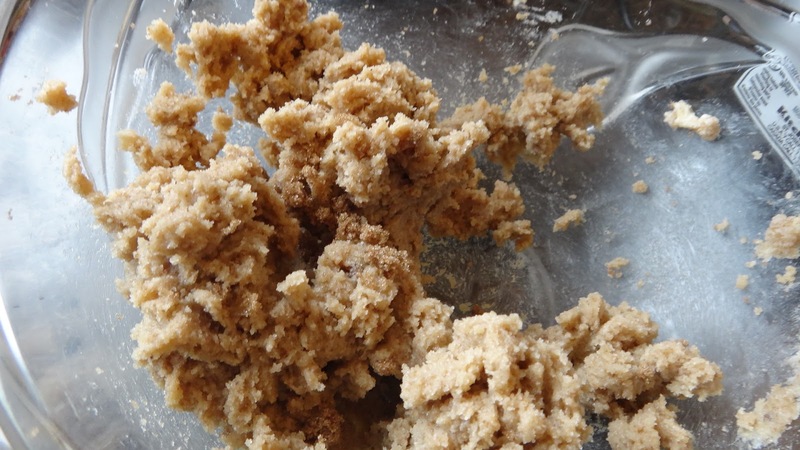 If you want to make cookies, then put this dough into the fridge for at least 1/2-1 hour. This will make the butter cold again and the cookies will not spread as much. 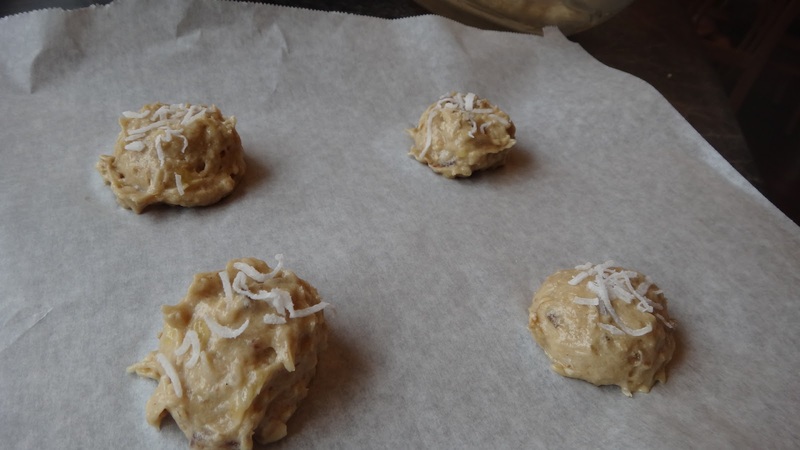 Once they have chilled you can scoop them with a small ice cream scoop or 2 small spoons onto parchment paper or Silpat silicone sheet to bake 12 minutes. 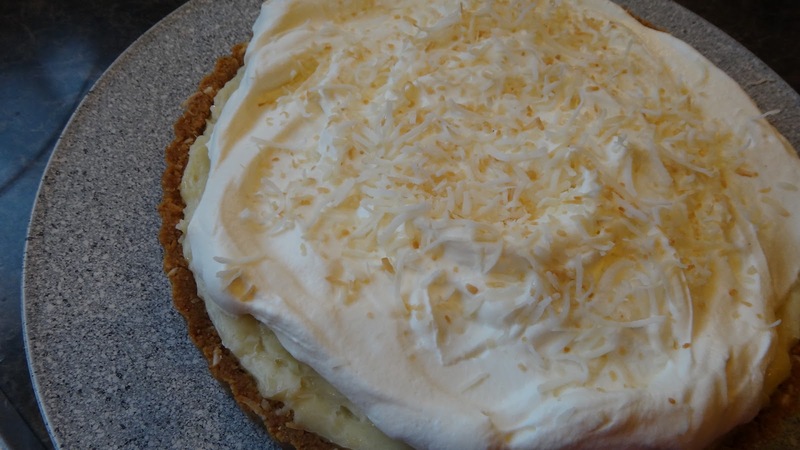 I added a bit of coconut to the tops. Once cooled remove with a spatula. They are soft like a little cake. 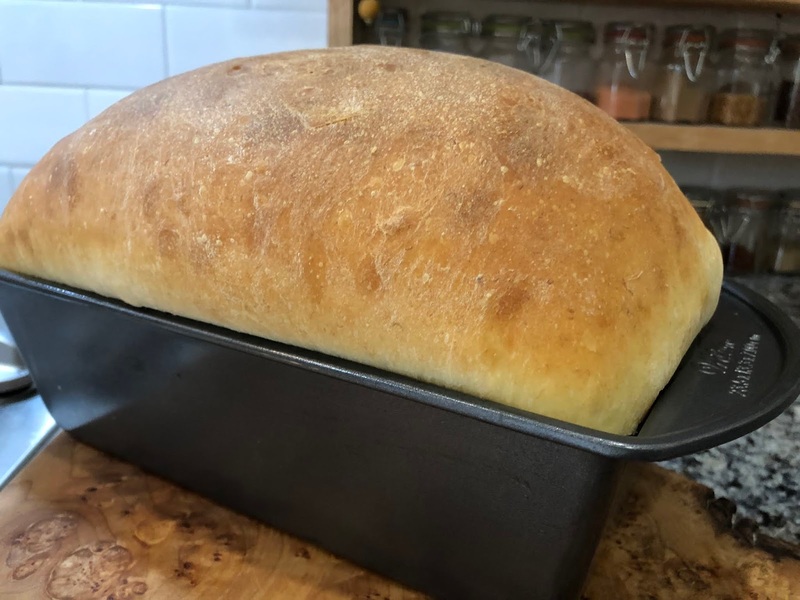 You can bake this into 2 small buttered and floured loaf pans for approx 35-40 minutes or when a toothpick inserted comes out clean. If your loaf is getting too browned loosely drape some foil over the top. 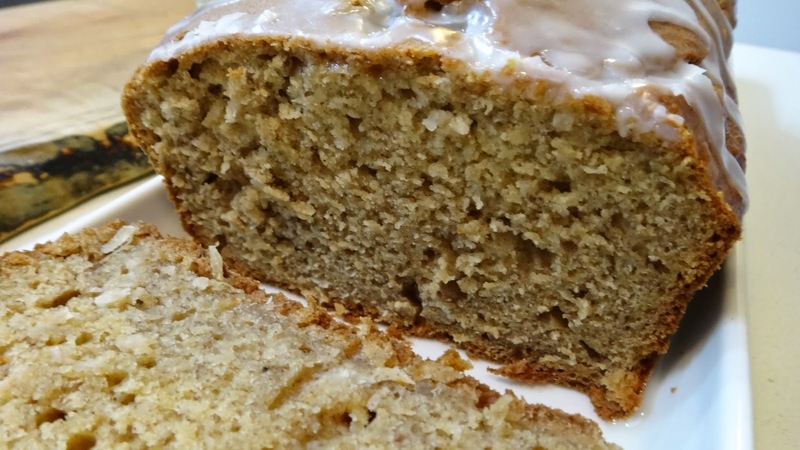 The high sugar content can brown the cake quickly. If your oven tends to bake hot then set heat to 350 degrees instead of 375. A sweet bite for a coffee break. 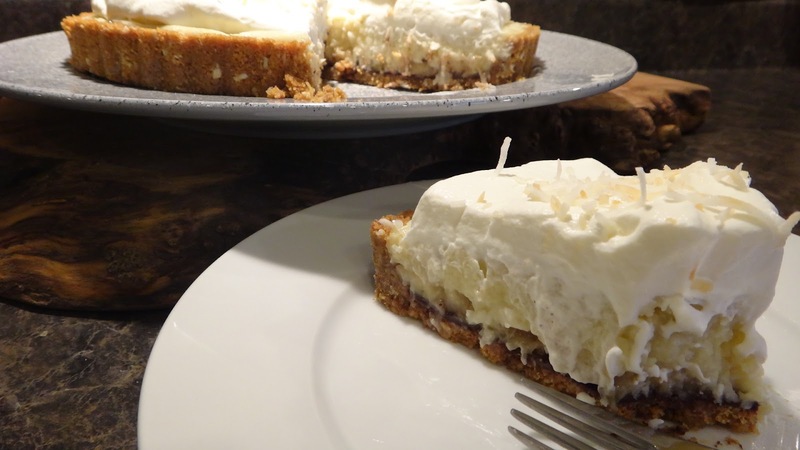 It’s coconut custard with a bottom layer of caramelized bananas and just a breath of chocolate on the crust. 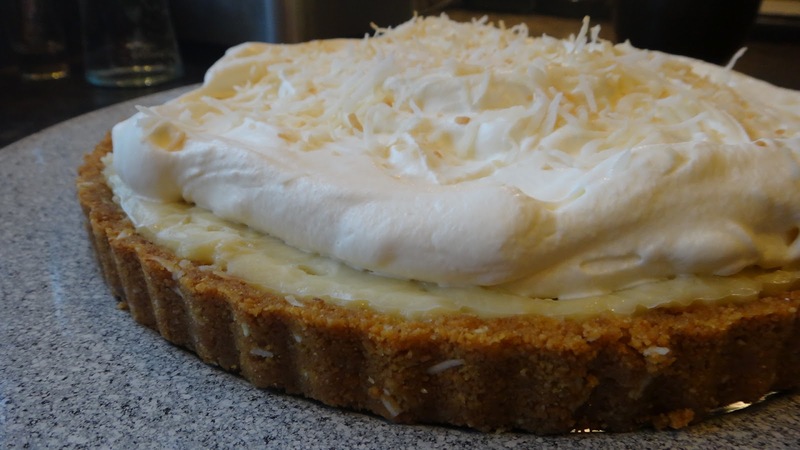 Then it is all topped off with rum whipped cream and toasted coconut. There are lots of steps but you can make the pie one day and them top and serve the following. * you also need a removable bottom tart pan or a glass pie plate. 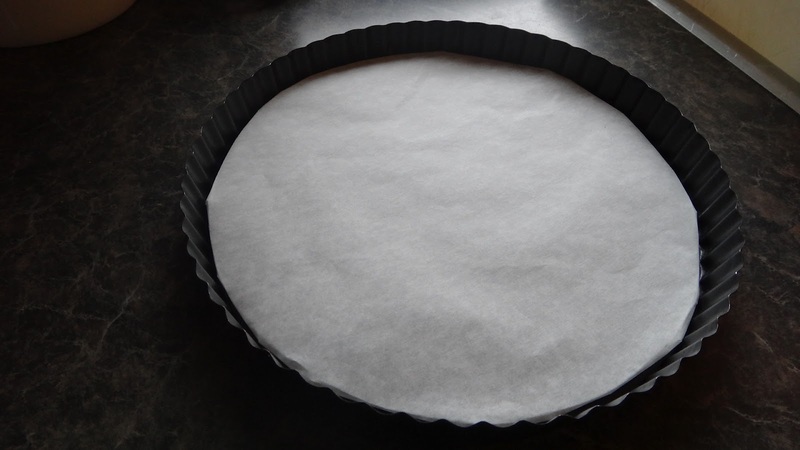 Step 1: I like to line a removable tart pan with parchment paper. I just fold over the extra paper and place back in the tin. You do not need to do this however, it allows you to easily slide the entire pie off of the bottom once its chilled and ready to serve. I can then put it on a serving platter and not worry about cutting the slices on my pan. Step 2: prepare crust in a medium bowl. 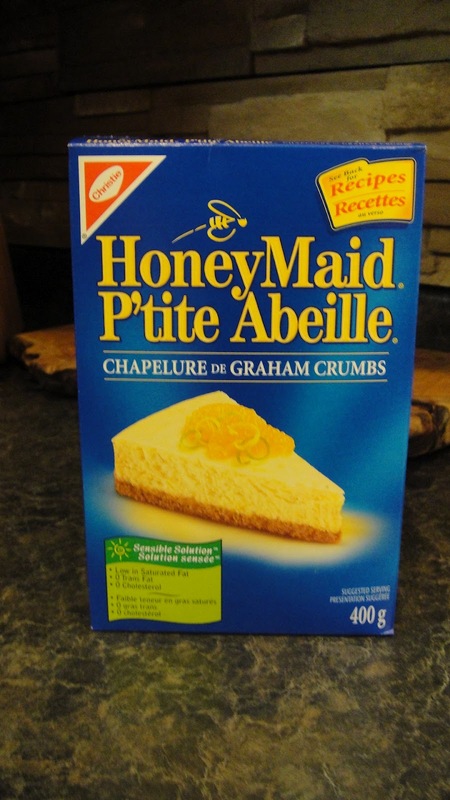 Add graham cracker crumbs, shredded coconut, melted butter and sugar. Mix until resembles wet sand. Step 3: press into pan using a measuring cup -this makes a nice smooth even crust. 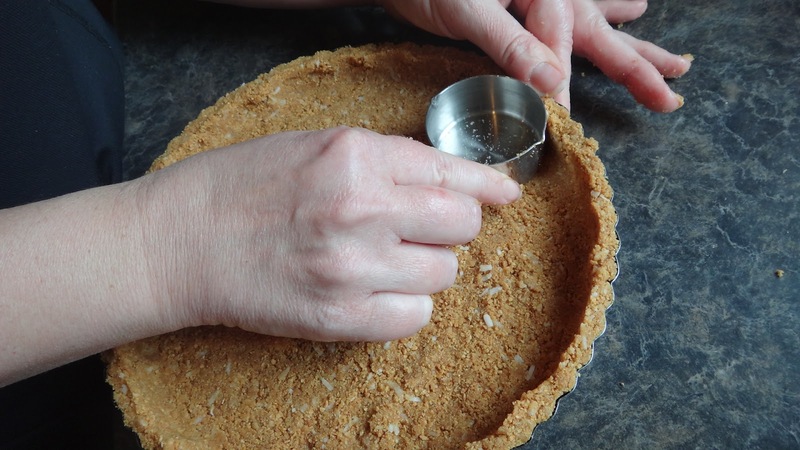 Step 4: Carefully lift pie by the sides of the pan (or the crust will fall out!) and put onto a cookie sheet. Bake at 350 degrees F for 8 minutes until the butter melts and the crust sets. Remove and set aside. Step 5: melt any good quality chopped dark chocolate in a small bowl which will entirely cover a pot of simmering water. 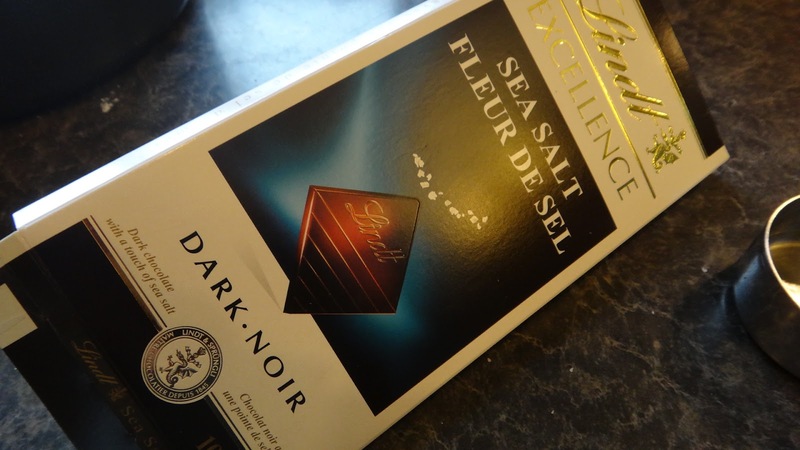 Do not let any water get into the chocolate or it will seize up and not get liquid. You can also melt chocolate in a microwave safe bowl in 20 second increments. I stir after each 20 seconds until liquid. This amount takes about 3or4 20 second increments in the microwave to melt completely. This method avoids cooking it too quickly in the microwave and burning. Step 6: pour liquid on crust and use a small spatula to spread it evenly. It should be a very small amount to just barely taste at the bottom of the pie. Once it cools it will harden. This layer also prevents the crust from getting soggy once the bananas are put on. Step 7: prepare the banana layer. 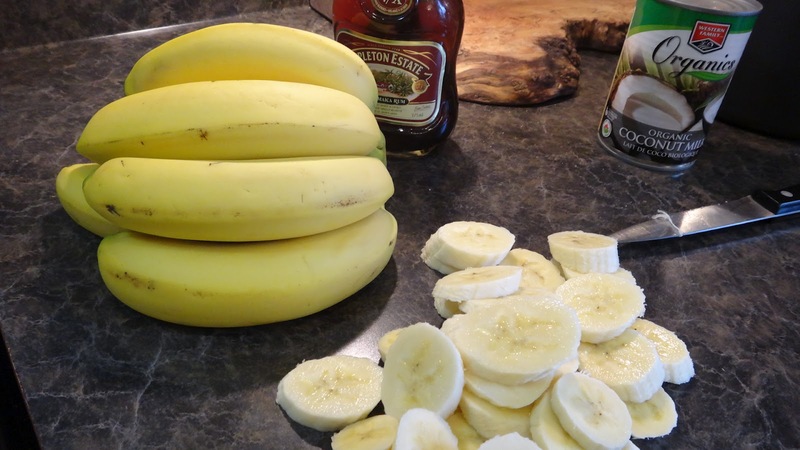 Slice bananas (not too ripe) and measure ingredients. 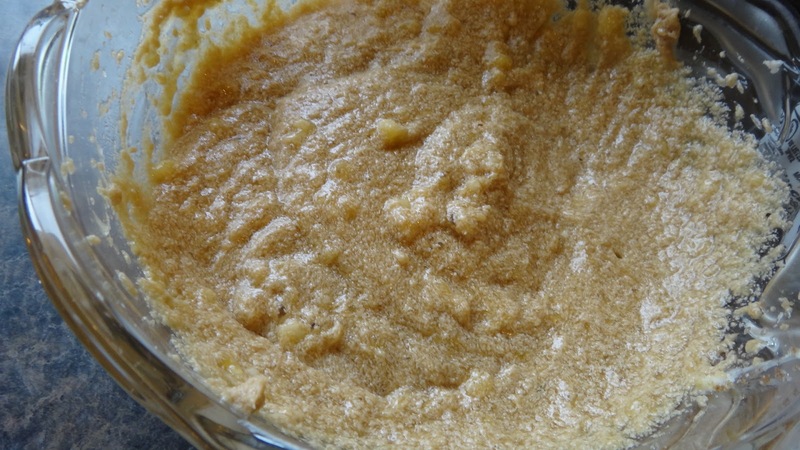 In a saute pan melt butter and brown sugar until sugar has dissolved. Add rum and bananas. Toss to coat and remove from heat. 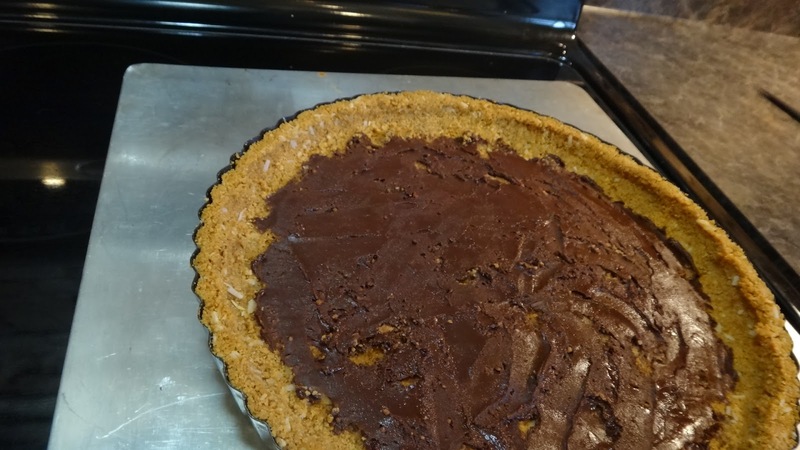 Step 8: pour evenly over the chocolate layer on crust. Tilt pan to allow the liquid to evenly coat into the corners. 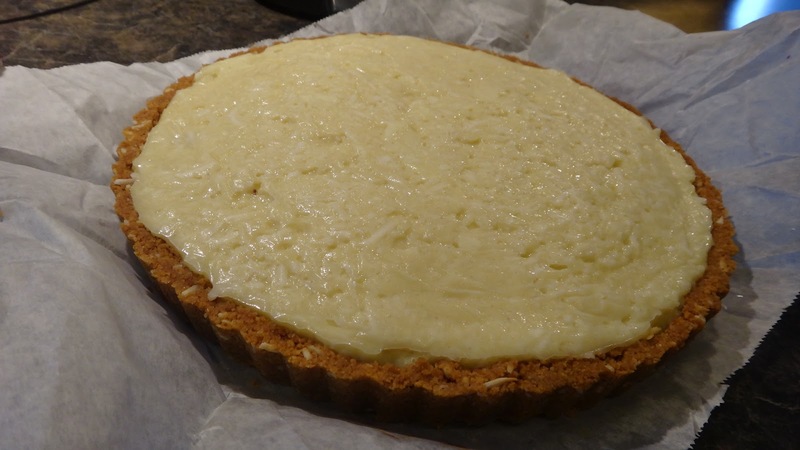 Step 9: prepare coconut custard filling. In a heavy pot add sugar. cornstarch, minute tapioca, salt. Turn on heat to medium and add coconut milk, egg yolks. 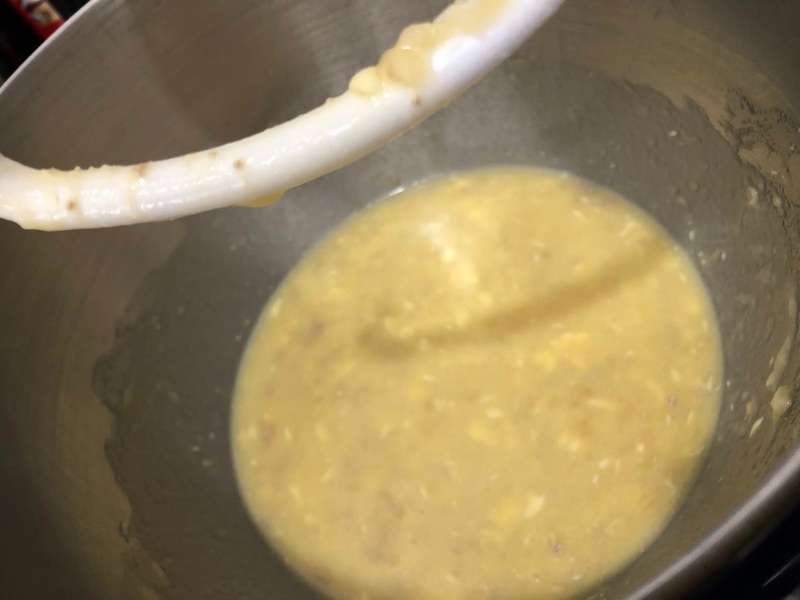 Stir constantly until the mixture comes to a gentle boil. Once it boils it will thicken. This may take 4-5 minutes do not walk away and leave it. Once it boils cook 30 seconds and remove from heat. 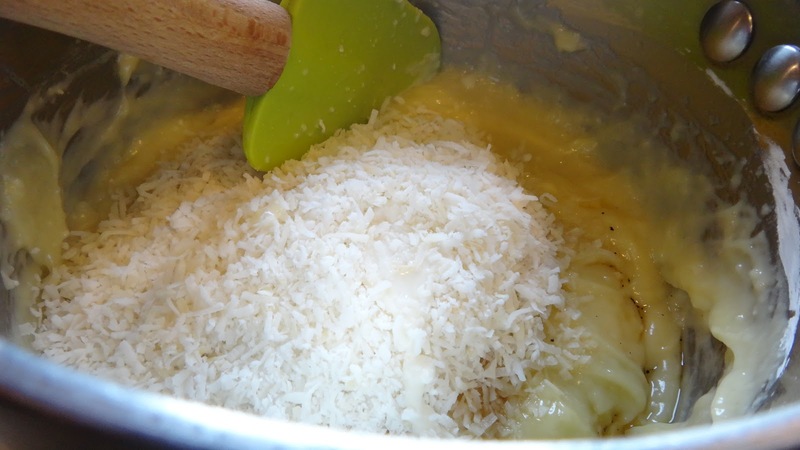 Add butter, shredded coconut, vanilla and coconut extracts. 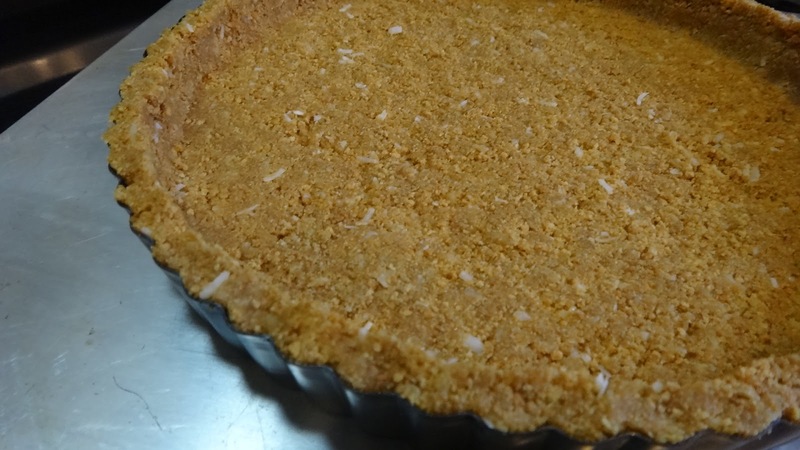 Step 10: pour on to crust and spread evenly. 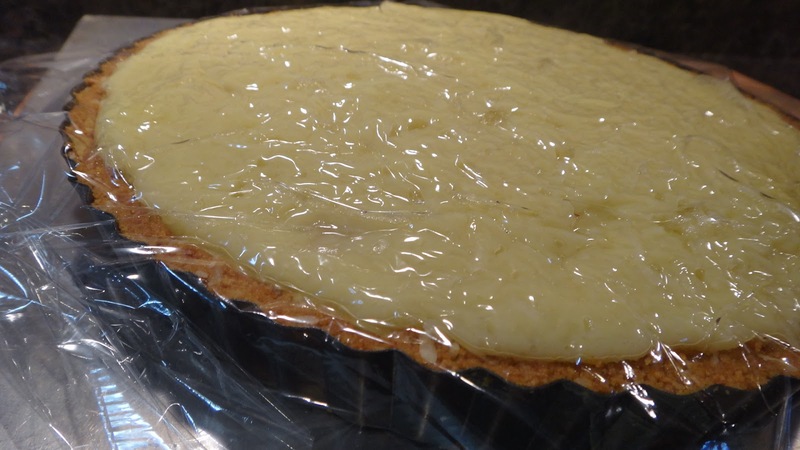 Place a piece of plastic wrap directly on top of hot custard and let cool to room temperature. Cool completely in fridge at least 5 hours -or you can leave it to serve the following day. Step 11: once the pie has cooled. Lift removable bottom from sides and unfold the parchment paper. Carefully loosen bottom from paper with a spatula knife and slide onto serving platter. Step 12: whip cream with sugar(I used my homemade vanilla sugar), powdered milk and rum until stiff enough to make a peak. 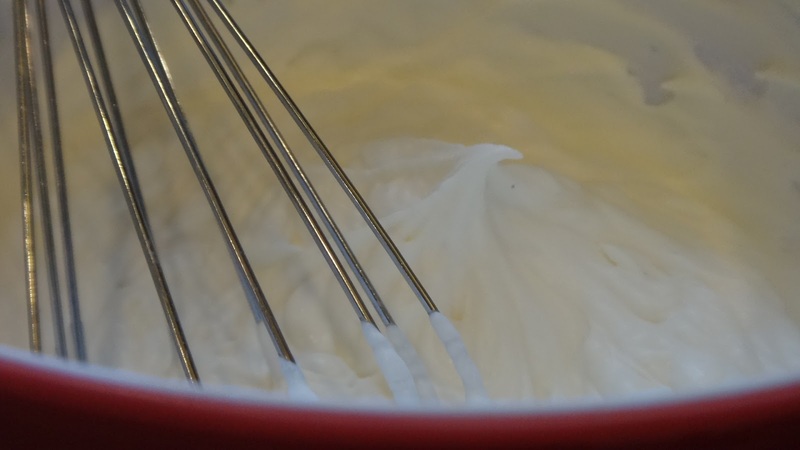 The dry milk will stabilize the cream. Step 13: toast a few tbsp coconut in a pan on stove (watch it- it will burn!) If you have a fresh coconut this is the place the make some nice curls with a peeler and toast. 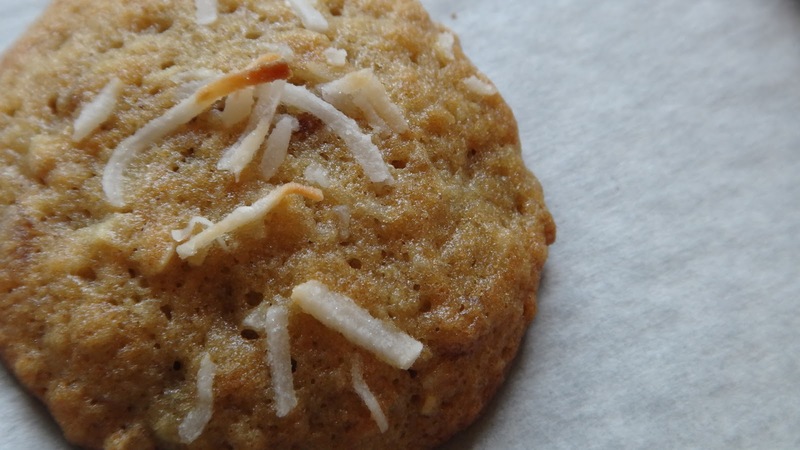 Slather on the cream, top with the toasted coconut and serve. One bite lets you know it was worth every bit of effort!